Last week, I was the first Language, Data and Knowledge Conference (LDK 2017) hosted in Galway, Ireland. If you show up at a natural language processing conference (especially someplace like LREC) you’ll find a group of people who think about and use linked/structured data. 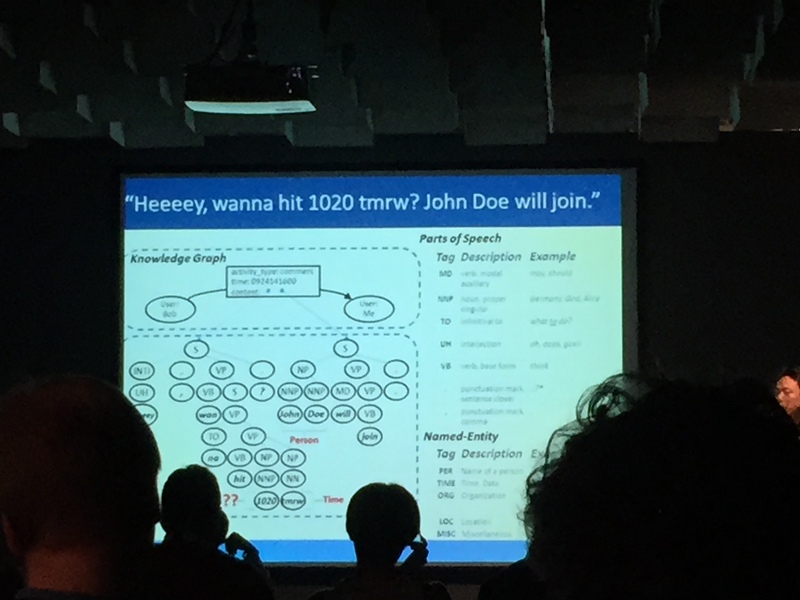 Likewise, if you show up at a linked data/semantic web conference, you’ll find folks who think about and use NLP. I would characterize LDK2017 as place where that intersection of people can hang out for a couple of days. The conference had ~80 attendees from my count. I enjoyed the setup of a single track, plenty of time to talk, and also really trying to build the community by doing things together. I also enjoyed the fact that there were 4 keynotes for just two days. It really helped give spark to the conference. Antal van den Bosch gave an excellent keynote emphasizing the need for what he termed holistic approach to language especially for questions in the humanities and social science (tutorial here). This holistic approach takes into account the rich context that word occur in. In particular, he called out the notions of ideolect and socialect that are ways word are understood/used individually and in a particular social group. He are argued the understanding of these computational is a key notion in driving tasks like recommendation. I personally was interested in Antal’s joint work with Folgert Karsdorp (checkout his github repos!) on Story Networks – constructing networks of how stories are told and retold. For example, how the story of Red Riding Hood has morphed and changed overtime and what are the key sources for its work. This reminded me of the work on information diffusion in social networks. This has direct bearing on how we can detect and track how ideas and technologies propagate in science communication. I had a great discussion with SocialAI team (Erica Briscoe & Scott Appling) from Georgia Tech about their work on computational social science. In particular, two pointers: the new DARPA next generation social science program to scale-up social science research and their work on characterizing technology capabilities from data for innovation assessment. There were a number of talks that focused on how to deal with entities that aren’t necessarily popular. Bichen Shi presented work done at Nokia Bell Labs on entity mention disambiguation. They used Apache Spark to train 700,000 classifiers – one per every entity mention in wikipedia. This allowed them to obtain much more accurate per-mention entity links. Note they used Gerbil for their evaluation. Likewise, Hendrik ter Horst focused on entity linking specifically targeting technical domains (i.e. MeSH & chemicals). During Q/A it was clear that straight-up gazeetering provides an extremely strong baseline in this task. Marieke van Erp presented work on fine-grained entity typing in Spanish and Dutch using word embeddings to go classify hundreds up types. Natural language generation from knowledge bases continues a pace. Kathleen McKeown‘s keynote touched on this, in particular, her recent work on mining paraphrasal templates that combines both knowledge bases and free text. I was impressed with the work of Nina Dethlefs on using deep learning for generating textual description from a knowledge base. The key insight was how to quickly generate systems to do NLG where the data was sparse using hierarchical composition. In googling around when writing this trip report I stumbled upon Ehud Reiter’s blog which is a good read. While not a theme, there we’re some really nice slides describingfundamentals. Overall, it was a good kick-off to a conference. Very well organized and some nice research. At the end of last week, I was at a small workshop held by the EXCITE project around the state of the art in extracting references from academic papers (in particular PDFs). This was an excellent workshop that brought together people who are deep into the weeds of this subject including, for example, the developers of ParsCit and CERMINE. While reference string extraction sounds fairly obscure the task itself touches on a lot of the challenges one needs in general for making sense of the scholarly literature. But, there’s a lot of great information in papers so we need to get our machines to read. end aside. Check out these slides from Dominika Tkaczyk that give a nice visual overview of this process. In general, performance on this task is pretty good (~.9 F1) for the reference parsing step but gets harder when including all steps. Min-Yen Kan gave an excellent talk about how text mining of the academic literature could improve the ability for researchers to come to grips with the state of science. He positioned the field as one where we have the ground work and are working on building enabling tools (e.g. search, management, policies) but there’s still a long way to go in really building systems that give insights to researchers. As custodian of the ACL Anthology about trying to put these innovations into practice. Prof. Kan is based in Singapore but gave probably one of the best skype talks I have ever been part of it. Slides are below but you should check it out on youtube. Another example of improving the reading experience was David Thorne‘s presentation around some of the newer things being added to Utopia docs – a souped-up PDF reader. In particular, the work on the Lazarus project which by extracting assertions from the full text of the article allows one to traverse an “idea” graph along side the “citation” graph. On a small note, I really like how the articles that are found can be traversed in the reader without having to download them separately. You can just follow the links. As usual, the Utopia team wins the “we hacked something really cool just now” award by integrating directly with the Excite projects citation lookup API. Finally, on the reading experience front. Andreas Hotho presented BibSonomy the social reference manager his research group has been operating over the past ten years. It’s a pretty amazing success resulting in 23 papers, 160 papers use the dataset, 96 million google hits, ~1000 weekly active users active. Obviously, it’s a challenge running this user facing software from an academic group but clearly it has paid dividends. The main take away I had in terms of reader experience is that it’s important to identify what types of users you have and how the resulting information they produce can help or hinder in its application for other users (see this paper). Michael Levin, Stefan Krawczyk, Steven Bethard, and Dan Jurafsky. 2012. Citation-based bootstrapping for large-scale author disambiguation. Journal of the American Society for Information Science and Technology 63:5, 1030-1047. In the second day of the workshop, we broke out into discussion groups. In my group, we focused on understanding the role of deep learning in the entire extraction process. Almost all the groups are pursing this. I was thankful to both Akansha Bhardwaj and Roman Kern for walking us through their pipelines. In particular, Akansha is using scanned images of reference sections as her source and starting to apply CNN’s for doing semantic segmentation where they were having pretty good success. We discussed the potential for doing the task completely from the ground up using a deep neural network. This was an interesting discussion as current state of the art techniques already use quite a lot of positional information for training This can be gotten out of the pdf and some of the systems already use the images directly. However, there’s a lot of fiddling that needs to go on to deal with the pdf contents so maybe the image actual provides a cleaner place to start. However, then we get back to the issue of resources and how to appropriately generate the training data necessary. The organizers set-up a slack backchannel which was useful. I’m not a big fan of skype talks, but they were able to get two important speakers that way and they organized it well. When it’s the difference between having field leaders and not, it makes a big difference. EU projects can have a legacy – Roman Kern is still using code from http://code-research.eu where Mendeley was a consortium member. More workshops should try the noon to noon format. Last week, I hung out in Bethlehem, Pennsylvania for the the 14th International Semantic Web Conference. Bethlehem is famous for the Lehigh University Benchmark (LUBM) and Bethlehem Steel. This is the major conference focused on the intersection of semantics and web technologies. In addition to being technically super cool, it was a great chance for me to meet many friends and make some new ones. There were 265 submissions across all tracks which is surprisingly the same number as last year. Before getting into what I thought were the major themes of the conference, a brief note. Reviewing is at the heart of any academic conference. While we can always try and improve review quality, it’s worth calling out good reviewing. The best reviewers were Maribel Acosta (research) and Markus Krötzsch (applied). As data sets and ontologies track co-chair, I can attest to how important good reviewers are. For this new track we relied heavily on reviewers being flexible and looking at these sorts of contributions differently. So thanks to them! Maybe its because I attended the NLP & DBpedia workshop or the conversation I had about string similarity with Michelle Cheatham, but one theme that I saw was the continued amalgamation of natural language processing (NLP) style entity resolution with database entity resolution (i.e. record linkage). This movement stems from the fact that an increasing amount of linked data is a combination of data extracted from semi-structured sources as well as from NLP. But in addition to that, NLP sources rely on some of these semi-structured datasources to do NLP. Probably, the best example of that idea is the work that Andrew McCallum presented in his keynote on “epistemlogical knowledge bases”. Briefly, the idea is to reason with all the information coming from both basic low level NLP (e.g. basic NER, or even surface forms) as well as the knowledge base jointly (plus, anything else) to generate a knowledge base. One method to do this is universal schemas. For a good intro, check out Sebastien Riedel’s slides. From McCallum, I like the following papers which gives a good justification and results of doing collective/joint inference. A Joint Model for Discovering and Linking Entities. Michael Wick, Sameer Singh, Harshal Pandya, Andrew McCallum. Third International Workshop on Automated Knowledge Base Construction (AKBC), 2013. One approach to entity linking that I liked was from the Raphael Troncy’s crew titled “Reveal Entities From Texts With a Hybrid Approach” (paper, slides). (Shouldn’t it be “Revealing..”?). They showed that by using essentially the provenance of the data sources they are able to build an adaptive entity linking pipeline. Thus, one doesn’t necessarily have to do as much domain tuning to use these pipelines. While not specifically about entity resolution, a paper worth pointing out is Type-Constrained Representation Learning in Knowledge Graphs from Denis Krompaß, Stephan Baier and Volker Tresp. They show how background knowledge about entity types can help improve link prediction tasks for generating knowledge graphs. Again, use the kitchen sink and you’ll perform better. There were a couple of good resources presented for entity resolution tasks. Bryl, Bizer and Paulheim produced a dataset of surface forms for dbpedia entities. They were able to boost performance up to 20% for extracting accurate surface forms for entities through filtering. Another tool, LANCE looks great for systematically generating benchmark and test sets for instance matching (i.e. entity linking). Also, Michel Dumontier presented work that had a benchmark for entity linking from the life sciences domain. Collecting, Integrating, Enriching and Republishing Open City Data as Linked Data. Checkout, slide 5 and on. KR2RML – using the nested relational model to do munging. Even the most centralized solution, the LODLaundromat which is a clean crawl of the entire web of data supports Linked Data Fragments. In some sense, by asking the server to do less you can handle more linked data, and thus do more powerful analysis. This is exemplified by the best paper LODLab byLaurens Rietveld, Wouter Beek, and Stefan Schlobach, which allowed for the reproduction of 3 existing analysis of the web of data at scale. Ringo: Interactive Graph Analytics on Big-Memory Machines by Y. Perez, R Sosic, A. Banerjee, R. Puttagunta, M. Raison, P. Shah, J. Leskovec. SIGMOD 2015. The folks at Oxford presented RDFox: A Highly-Scalable RDF Store designed for huge main memory machines. It also has a sweet reasoner built in. Datalog in a triple store – sweet. Cray’s URIKA appliance for RDF that again leveraged massive RAM and parallel threads. (I enjoyed the talk from David Mizell on it’s development in the scalable kb workshop. well not in memory…but BlazeGraph uses GPUs – sweet – It’s always fun talking to Bryan Thompson. Additionally, this flexibility was exemplified by the best applied paper, “Building and Using a Knowledge Graph to Combat Human Trafficking” by Pedro Szekely et al.. They used the parts of the semantic web stack that helped (like ontologies and JSON-LD) but used elastic search for storage to create a vital and important solution to a real challenging problem. Overall, this was an excellent conference. Next year’s conference is in Kobe, I hope you submit some great papers and I’ll seen you there! ☑ and ❌ seem to be a thing on presentations. Juan, if I come to Austin will you drink a bud light? Optional HTML paper submissions in 2016, why not? Lehigh University has a beautiful campus. Thomson Reuters does linked data. The semantic web challenge is getting professional. Next week is the 2015 International Semantic Web Conference. I had the opportunity with the Michel Dumontier to chair a new track on Datasets and Ontologies. A key part of of the Semantic Web has always been shared resources, whether it’s common standards through the W3C or open datasets like those found in the LOD cloud. Indeed, one of the major successes of our community is the availability of these resources. ISWC over the years has experimented with different ways of highlighting these contributions and bringing them into the scientific literature. For the past couple of years, we have had an evaluation track specifically devoted to reproducibility and evaluation studies. Last year datasets were included to form a larger RDBS track. This year we again have a specific Empirical Studies and Evaluation track along side the Data & Ontologies track. The reviewers had a tough job for this track. First, it was new so it’s hard to make a standard judgment. Secondly, we asked reviewers not only to review the paper but the resource itself along a number of dimensions. Overall, I think they did a good job. Below you’ll find the resources chosen for presentation at the conference and a brief headline of what to me is interesting about the paper. In the spirt of the track, I link to the resource as well as the paper. LSQ: Linked SPARQL Queries Dataset by Muhammad Saleem, Muhammad Intizar Ali, Qaiser Mehmood, Aidan Hogan and Axel-Cyrille Ngonga Ngomo (paper). – Query logs are becoming an ever more important resource from everything from search engines to database query optimization. See for example USEWOD. This resource provides queryable versions in SPARQL of the query logs from several major datasets including dbpedia and linked geo data. Provenance-Centered Dataset of Drug-Drug Interactions by Juan Banda, Tobias Kuhn, Nigam Shah and Michel Dumontier (paper) – this resources provides aggregated set of drug-drug interactions coming from 8 different sources. I like how they provided a doi for the bulk download of their datasource as well as spraql endpoint. It also uses nanopublications as the representation format. Semantic Bridges for Biodiversity Science by Natalia Villanueva-Rosales, Nicholas Del Rio, Deana Pennington and Luis Garnica Chavira (paper) – this resource allows biodiversity scientist to work with species distribution models. The interesting thing about this resource is that it not only provides linked data, a spraql endpoint and ontologies but also semantic web services (i.e. SADI) for orchestrating these models. DBpedia Commons: Structured Multimedia Metadata for Wikimedia Commons by Gaurav Vaidya, Dimitris Kontokostas, Magnus Knuth, Jens Lehmann and Sebastian Hellmann (paper) – this is another chapter in exposing wikimedia content as structured data. This resource provides structured information for the media content in Wikimedia commons. Now you can spraql for all images with a CC-by-sa v2.0 license. The GeoLink Modular Oceanography Ontology by Adila A. Krisnadhi, and a big author list (paper) – This resource provides a rich set of ontology design patterns for integrating geosciences information for use in EarthCube a major US cyberinfrastructure for this domain. The Transport Disruption Ontology by David Corsar and Milan Markovic (paper) – This ontology provides a ton of terms around transport disruptions, everything from rain to road closures and riots. It shows the richness that ontologies can provide even in very specific domains. Overall, I think this is a good representation of the plethora of deep datasets and ontologies that the community is creating. Take a minute and check out these new resources. Last week I was in Florence Italy for the 23rd International World Wide Web Conference (WWW 2015). This is the leading computer science conference focused on web technology writ large. It’s a big conference – 1400 attendees this year. WWW is excellent for getting a good bearing on the latest across multiple subfields in computer science. Another way to say it is that I run into friends from the semantic web community, NLP community, data mining community, web standards community, the scholarly communication community, etc.. I think on the Tuesday night I traversed four different venues hanging out with various groups. What was I doing there? First, was that I co-authored a research track paper with Marcin Wylot and Philippe Cudré-Mauroux of the eXascale Infolab (cool name) on Executing Provenance Queries over Web Data (slides, paper). We showed that because of the highly selective nature of provenance on the web of data, we can actually improve query performance within a triple store. I was super happy to have this accepted given the ~14%! acceptance rate. Second, I gave the opening talk of the Semantics, Analytics, Visualisation: Enhancing Scholarly Data (SAVE-SD) workshop. I discussed the current state of scholarly productivity and used the notion of the burden of knowledge as a motivation for knowledge graphs as a mechanism to help increase that productivity. I even went web for my slides. Continuing on the theme of knowledge graphs, I participated on a panel in the industry track around knowledge graphs. More thoughts on this coming up. I could call this Entities everywhere. Perhaps, it was the sessions I chose to attend but it felt like when I was at the conference in 2010 where every other paper was about online advertising. There were a ton of papers on entity linking, entity disambiguation, entity (etc.) many others had knowledge base construction as a motivation. There were two tutorials on knowledge graphs both of them were full and the one from Google/Facebook involved moving to a completely new room. Both were excellent. The one from the Yago team has really good material. As a side note, it was interesting to sit-in on tutorials where I already have a decent handle on the material. It let me compare my own intellectual framework for the material and others out there. For example, I liked the Yago tutorial’s distinction between source-centric and yield-centric information extraction and how we pursue the yield approach when doing automated knowledge base construction. A recommended exercise for the reader. Beyond just being a plethora of stuff, I think our panel discussion highlighted themes that appeared across several papers. All the organizations on the industry panel spend significant resources on quality maintenance of their knowledge graphs. The question here is how to best decrease the amount of human input and increase automation. An interesting example that was talked about quite frequently is the move of Freebase to Wikidata. Wikidata runs under the same guidelines as Wikipedia so all facts need to have claims grounded in sources from the Web. Well it turns out this is difficult because many facts are sourced from Wikipedia itself. This kind of dare I say it provenance is really important. Most current large scale knowledge graphs support provenance but as we automate more it would be nice to be able to automatically judge these sources using that provenance. One paper that I saw that addressed quality issues this was GERBIL – General Entity Annotator Benchmarking Framework. This 25 author paper! devised a common framework for testing entity linking tools. It’s great to see the community looking at these sorts of common QA frameworks. This seemed to be bubbling up. On the panel, the company Tagasauris was looking at constructing a mediaGraph by analyzing video content. During the Yago tutorial, the presenters mentioned potential future work on extracting common sense knowledge by looking at videos. In general, both extraction of facts from multimedia but also using knowledge graphs to understand multimedia seems like a challenging but fruitful area. One particular example was the paper “Tagging Personal Photos with Transfer Deep Learning”. What was cool was the injection of a personal photo ontology into the training of the network as priors. This led to both better results but probably more impotently decreased the training time. Another example is the work from Gerhard Weikum’s group on extracting knowledge from movie scripts. Finally, as I commented at the Linked Data on the Web Workshop, the growth of knowledge graphs is a triumph of the semantic web and linked data. Making knowledge bases open and available on the Web using reusable schemes has really been a boon to the area. It’s obvious but is worth repeating: the web is really big! We progress on all these dimensions. But the scale of the web doesn’t just change the technology we need to develop but it changes our methods. For example, a paper I liked a lot was “Leveraging Pattern Semantics for Extracting Entities in Enterprises”. This bares resembles towards problems we face extracting entities that are not found on the web because there only mentioned within a private environment (e.g. internal product names). But even in this environment they rely on the Web. They rank semantic patterns they extract by using relations extracted from the web. For me, it means that even if the application isn’t necessarily for “the web”, I should think about the web as a potential part of the solution. It was a pleasure to meet C. Lee Giles of CiteSeerX. It was good seeing an overview of that system and he had some good pointers (e.g. GROBID for metadata extraction and ParsCit for citation extraction). There were also a number of main track papers that applied methods to scholarly content. Chien looked at extracting semantics from mathematical expressions testing on a web math forums. Li et al. looked at algorithms for suggesting a substitute for a particular team member. The paper Robust Group Linkage looked at how to identify multiple entities belonging to the same group. For example, restaurants in the same chain, or researchers in the same subarea. Overall, WWW 2015 was a huge event so this trip report really is just what I could touch. I didn’t even get the chance to go to the W3C sessions and Web Science talks. You can check out all the proceedings here, definitely worth a look. If you’re a researcher remember that Broder’s “A taxonomy of web search” – was originally rejected from WWW 2002, it now has 1700+ citations. If you do machine learning, do your parameter studies. Most papers had them. PROV and information diffusion combined. So awesome. Ah conference internet… It’s always hard. People are hiring like crazy. Booths from Baidu, Facebook, Yahoo, LinkedIn. Oh, and never discount how frisbee’s can motivate highly educated geeks. On the hiring note, I liked how the companies listed their attendees and their talks. Tons and tons of talks with authors from companies. I should really do some stats. It was like every paper. Italy, food, florentine steak – yummy! Corollary, running is necessary but running in Florence is beautiful. Head by the Duomo across the river and up through the gardens. Larry and Sergei won the test of time award. Gotta ask the folks at Insight about their distributional semantics work. A couple of weeks ago, I was at the European Data Forum in Athens talking about the Open PHACTS project. You can find a video of my talk with slides here. Slides are embedded below. It’s been about a week since I got from Australia attending the International Semantic Web Conference (ISWC 2013). This is the premier forum for the latest in research on using semantics on the Web. Overall, it was a great conference – both well run and there was a good buzz. (Note, I’m probably a bit biased – I was chair of this year’s In-Use track) . ISWC is a fairly hard conference to get into and the quality is strong. More importantly, almost all the talks I went to were worth thinking about. You can find the proceedings of the conference online either as a complete zip here or published by Springer. You can find more stats on the conference here. As an aside, before digging into the meat of the conference – Sydney was great. Really a fantastic city – very cosmopolitan and with great coffee. I suggest Single Origin Roasters. Also, Australia has wombats – wombats are like the chillest animal ever. We are really seeing how semantic technologies can power great applications. All three keynotes highlighted the use of Semantic Tech. I think Ramanathan Guha’s keynote probably highlighted this the best in his discussion of the growth of schema.org. Beyond the slide above, he brought up representatives from Yandex, Yahoo, and Microsoft on stage to join Google to tell how they are using schema.org. Drupal and WordPress will have schema.org in their cores in 2014. Schema.org is being used to drive everything from veteran friendly job search, to rich pins on Pinterest and enabling Open Table reservations to be easily put into your calendar. So schema.org is clearly a success. Peter Mika presented a paper on how Yahoo is using ontologies to drive entity recommendations in searches. For example, you search for Brad Pitt and they show you related entities like Angelina Jolie or Fight Club. The nice thing about the paper is that it showed how the deployment in production (in Yahoo! Web Search in the US) increases click through rates. I think it was probably Yves Raimond’s conference – he showed some amazing things being done at the BBC using semantic web technology. He had an excellent keynote at the COLD workshop – also highlighting some challenges on where we need to improve to ease the use of these technologies in production. I recommend you check out the slides above. Of all the applications, their work on mining the world service archive of the BBC to enrich content being created. This work won the Semantic Web Challenge. In the biomedical domain, there were two papers showing how semantics can be embedded in tools that regular users use. One showed how the development of ICD-11 (ICD is the most widely used clinical classification developed by the WHO) is supported using semtech. The other I liked was the use of excel templates (developed using RightField) that transparently captured data according to a domain model for Systems biology. Also in the biomedical domain, IBM presented an approach for using semantic web technologies to help coordinate health and social care at the semantic web challenge. Finally, there was a neat application presented by Jane Hunter applying these technologies to art preservation: The Twentieth Century in Paint. There were a number of interesting papers that were around the idea of using a combination of well-known ontologies and then either record linkage or other machine learning methods to populate knowledge bases. Our approach, knowledge graph identification (KGI) combines the tasks of entity resolution, collective classification and link prediction mediated by rules based on ontological information. Note to self: Karma is awesome! It’s pretty evident that when dealing with the web things are messy. There were a couple of papers that documented this empirically either in terms of the availability of endpoints or just looking at the heterogeneity of the markup available from web pages. In some sense, the papers mentioned in the prior theme also try to deal with this messiness. Here are another couple of papers looking at essentially how do deal with or even use this messiness. One thing that seemed a lot more present in this year’s conference than last year was the term entity. This is obviously popular because of things like google knowledge graph – but in some sense maybe it gives a better description of what we are aiming to get out of the data we have – machine readable descriptions or real world concepts/things. There are some things that are of interest that don’t fit neatly into the themes above. So I’ll just try a bulleted list. The workshops were very well attended. I attended the COLD workshop and the organized the Linked Science Workshop (LISC). My colleague Albert has provided a nice workshop report on the SemStat workshop. We actually worked in the LISC workshop looking at how semtech can support scientific reproducibility. You can find videos, speadsheets and our challenges to the community on figshare. I liked the methodological approach in Matthew Horridge, Tania Tudorache, Jennifer Vendetti, Csongor Nyulas, Mark Musen, Natasha F. Noy Simplified Ontology Editing for the Web: Is WebProtege Enough? – something to remember when trying to develop and test user interfaces. The Semantic Web Jam Session was amazing. Our paper on using NoSQL stores for RDF went over very well. Congrats to Marcin for giving a good presentation. The format of mixing talks from different tracks by topic and having only 20 minutes per talk was great. VUA had a great showing – 3 main track papers, a bunch of workshop papers, a couple of different posters, 4 workshop organizers giving talks at the workshop summary session, 2 organizing committee members, alumni all over the place, plus a bunch of stuff I probably forgot to mention. The colocation with Web Directions South was great – it added a nice extra energy to the conference. Peter Fox seemed to give a keynote just for me – concept maps, PROV followed with abductive reasoning. Did I mention that the coffee in Sydney (and Newcastle) is really good and lots of places serve proper breakfast!